Over 160,000 people have been impacted locally and globally by NewGround’s alumni change-maker projects. Who Did We Reach in 2017? 1000 – Executive Director offers reflection at event at West Angels Church honoring Martin Luther King Jr.– on what it means to truly respond with love when one triggers or upsets you. 30 – NewGround featured as a distinct model at Muslim-Jewish conference in New York City, organized by Shalom Hartman. 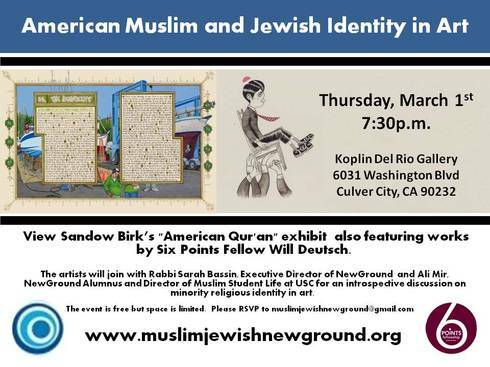 10 – NewGround co-leads Muslim-Jewish text study at Southern California Muslim Jewish forum. 18 – NewGround fellowship programming continues with the '17-'18 cohort. Who Did We Reach in 2016? 250 marched between Los Angeles houses of worship on March 6th inspired by powerful words from board member Rabbi Susan Goldberg and Executive Director Aziza Hasan, who spoke to the hundreds gathered about building relationships and raising their voices for pluralism, compassion, and love. 120 hear community leaders Rabbi Susan Goldberg and Aziza Hasan address the roots of violent extremism and explored sensible ways to restore understanding and civility on March 13th at the Islamic Center of Southern California in a panel entitled United Against Bigotry. 12 curently active NewGround program alumni projects with 3 new projects in the making. 100+ hear board member Brie Loskota speak on a panel with Hillary Clinton along with Mayor Eric Garcetti. 20+ Muslim & Jewish change-makers shared their stories of self-reflection & courage today with a class at Loyola Marymount University. 36 hear Aziza Hasan speak at Leo Baeck Temple as part of Yom Limud. 1,000,000+ watch this BuzzFeed video featuring NewGround Board member Rabbi Susan Goldberg; MAJIC Advisory Board member, Jihad Turk; and Reverend Francisco Garcia. The religious leaders got together on camera to discuss their religious stances on tough, contemporary issues. 1,000 view #LATogether short video published by California Community Foundation featuring NewGround Executive Director Aziza Hasan. Who Did We Reach in 2015? 40 Public officials from around the U.S. and around Europe and Africa learned about NewGround's model at the White House on a panel where NewGround Executive Director, Aziza Hasan, spoke on "Building Understanding and Cooperation Across Faiths"
4 MicroGrants awarded to change-maker fellows and alumni for their community service initiatives. 5 short videos featuring our change-makers and their impact as part of our Change-makers in action video series. 7,000 read message of Executive Director, Aziza Hasan on respecting "differences and the power of praying together" as featured in Pakistan's premier news outlet, Dawn News. 2 MAJIC change-makers featured in the Jewish Journal's graduation edition on leadership, philanthropy, and education. 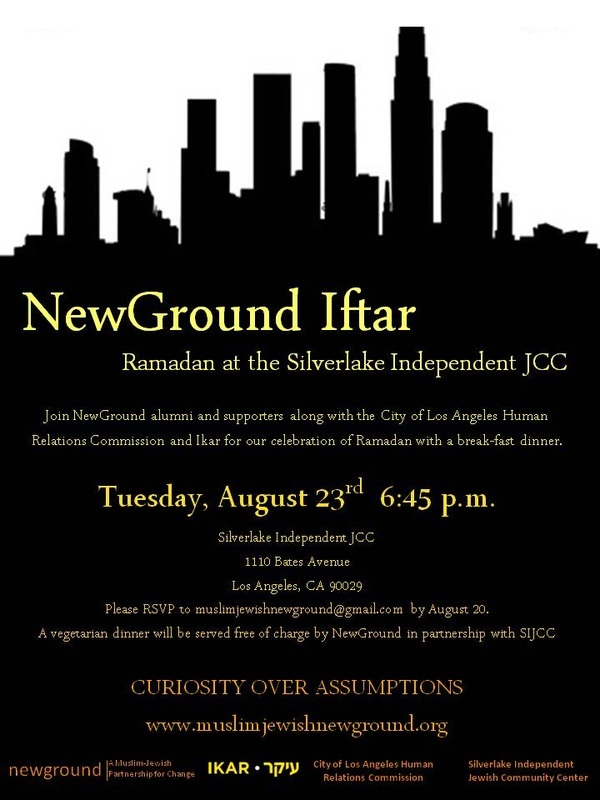 35 leaders and supporters of innovative Muslim-Jewish groups brought together by Austrian Consulate General Ulrike Ritzinger see NewGround and the Muslim Jewish Conference take center stage as models of engagement in Los Angeles and Vienna. 80 Executive Director Aziza Hasan was the commencement speaker for New Horizons' graduation as she shared her own personal experience of the challenges and reward of putting holy scripture into action. 150 A prayer for peace by Saaliha Khan, our Communications and Project Manager, to promote bridge-building at lunch with LA Mayor Eric Garcetti. 28 international delegates from over 25 countries inspired by NewGround's model and work in building bridges across boundaries sponsored by theU.S. Department of State. 30attend special luncheon on "Building bridges through the media" hosted by NewGround team of change-makers. 200 attend Interfaith Celebration of International Peace Day with NewGround change-maker panelists on Sept 20th. 90 attend Rosh Hashanah services at Open Temple in Venice and experience shared recitation through disruptive ritual with NewGround's Two Faiths One Prayer team. 1,000 view our change-makers as highlighted in "the Daily Upworthiest" & on the Upworthy website. Who Did We Reach in 2014? 10 Lebanese young professionals traveling with U.S. State Department in leadership exchange program consult with NewGround on effectively leveraging dialogue as a tool for pluralism. 30 Muslim and Jewish community members at our living room salon "What Keeps You Up At Night"
400 high school students at Campbell Hall Episcopalian High School with a MAJIC panel. 40 Academics and religious leaders at the 2014 Istanbul Process in Doha Qatar with a paper about the use of personal story as a foundation for interfaith dialogue. 200 Angelenos at the Righteous Conversations Gifting Ceremony in which NewGround's teenage leaders spoke about their experience in MAJIC. Who Did We Reach In 2013? 250 Angelenos at NewGround's annual storytelling event "NewGround Spotlight: Standing Up for the Other." 140 Jews and Muslims at the Islamic Center of Southern California's 2013 Weekend of Twinning Dialogue about "Standing Up for the Other." 130 Muslims and Jews at NewGround's annual Trailblazing Awards honoring Dr. Judith Glass and Nasreen Haroon and the legacy of Suzy and Wallly Marks Jr.
250 Angelenos at the Iman Cultural Center Peace Day featuring local groups working to build and sustain peace in the greater Los Angeles area. 60 Family Members of the current MAJIC High School Leadership Council at our Family Meet and Greet event at the home of Mustapha and Bonnie Baha in San Marino. 20 Angelenos at the "Borderlands" Exhibition at Actual Size Gallery in China Town- a panel discussion with NewGround alumni about personal and communal boundaries. Sponsored by Six Points Los Angeles. 11 Students at Hebrew Union College studying innovative projects within the Jewish communal infrastructure. 200 Angelenos at NewGround's 3rd annual Ramadan break fast celebrating the 2013 NewGround fellowship cohort culmination. Sponsored by Wilshire Boulevard Temple, Masjid Bilal Islamic Center, IKAR, and the Islamic Center of Southern California. 75 Angelenos at NewGround's "Countering Islamophobia" event featuring Little Mosque on the Prairie lead actor Zaib Shaikh speaking about the connection between anti-Semitism, Islamophobia and the imperative for Muslim civic engagement. 60 Youth participants in the peer justice program Shades through a training session held at the Museum of Tolerance. 400 Angelenos at mosques, synagogues, and religious schools across Los Angeles with the Carnival Against Hunger put on by the students of Muslims and Jews Inspiring Change. See media coverage here. 40 International religious leaders at the Doha International Center for Interfaith Dialogue 10th annual conference in Doha, Qatar where NewGround presented a paper on "Making The Personal Public: The Use of Personal Stories in Interfaith Engagement"
65 Muslims and Jews at a screening of "The Light In Her Eyes" at Temple Isaiah where the Jewish filmmaker documenting a traditional religious school for girls in Syria explored the larger implications for such a school. 150 Israeli American and Jewish young professionals at BINA LA on "Are American Jews Ready for 2050? 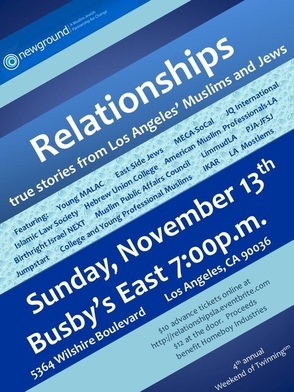 "- a talk about the transforming demographic realities of the United States and it impact on Jewish community relations. 200 Angelenos at the Hammer Museum Forum on Islamaphobiafeaturing NewGround Board Chair Edina Lekovic, NewGround Director Rabbi Sarah Bassin and NewGround alumnus Ali Mir. 10 Reform Jewish Youth Educators at the Youth Educators Conference on best practices in interfaith engagement with youth. 50 National Federation of Temple Youth (NFTY) Teenagers as part of the NFTY National Conventionwhere students learned about the model of the Muslims and Jews Inspiring Change (MAJIC)- a high school leadership council. 10 Saudi Arabian government officials and academicsvisiting with the State Department to learn about effective American models of pluralism and collaboration between government and non-profit entities. 40 National Federation of Temple Youth Group Students at the NFTY Social Justice Kallah to learn about the role of interfaith in social action. 30 University student leaders from around the country at the Challah for Hunger Summit on how to incorporate interfaith collaborative work into efforts to combat hunger. Who Did We Reach in 2012? 12 Azusa Pacific University students in an intercultural communications class with a lecture and discussion on the civic impact of interfaith engagement. 500 Angelenos as a finalist in Social Innovation Fast Pitch. 60 Jews with a NewGround alumni panel after a Wilshire Boulevard Temple screening of "The Other Son. 100 Religious and civic leaders at the first iftar ever hosted at City Hall by the Mayor's Office and the Human Relations Commission. NewGround was featured as an example of stellar civic engagement in the Muslim community. 100 American Jewish Committee young professionals at the ACCESS 20/20 conference in Washington D.C.
600 educators at the Los Angeles Religious Education Conference held by the Archdiocese of Los Angeles through the panel "Global Events/Local Events: Religious Perspectives of a Jew, a Catholic and a Muslim." 18 people at a private film screening and discussion of the 2007 Israeli film Strangers. Who Did We Reach in 2011? 150 Muslim and Jewish young professionals at NewGround's true storytelling event on the theme of "Relationships"
50 Muslims and Jews at Congregation Shomrei Torah in Santa Rosa, California with "Breakdowns and Breakthroughs: The History of Muslim-Jewish Relations Through a Los Angeles Lens"
70 residents of the Fountainview Jewish Home for the Aging with "Breakdowns and Breakthroughs"
20 members of Leo Baeck Temple's men's club with a text study titled, "Jewish Paradigms of Relating to the Other"
5 Rabbis at the Pacific Area Reform Rabbis Convention on "Moving Forward: How to respond to tense situations in Muslim-Jewish relations"